Last week (and the beginning of this week), I celebrated Passover. During this holiday, I give up a lot of foods like bread, rice, corn, beans, and soy products. This can be a tricky time as we are confined to matzo as most of our source of carbs. It also means that favorite year round foods, such as macaroni and cheese or soy-based veggie burgers, aren’t allowed. Of course, in many ways I’m used to restricting my diet. While growing up, I learned about the Kosher dietary rules during Hebrew school. One by one I decided to follow them. First, I stopped eating milk and meat together. This meant turning my usual bacon cheeseburger into a bacon burger. Next, I gave up all meats that couldn’t be kosher* while eating out. This wasn’t too hard. Except for bacon and the occasional Chinese food spare rib, I was never a big fan of shrimp, clams, ham and the like. Spare ribs were occasional enough that I gave them up easily. Bacon, however, I dreaded giving up. I expected it to be a difficult affair packed with cravings and backsliding. Instead, I turned my bacon burger into a plain burger and never looked back. 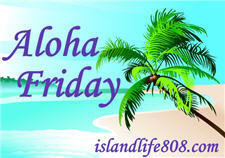 My Aloha Friday question for today is: What foods would you find difficult (if not impossible) to give up for a week? What foods would you find difficult or impossible to give up for the rest of your life? * To clarify, by “meats that couldn’t be kosher”, I mean meats that intrinsically couldn’t be kosher due to the animal they come from** such as ham (from pigs) and shrimp. I think I could give anything up for a week. But forever…pizza, chocolate, tomatoes,yogurt, burgers and fries. For a week I can’t go without Cherry Coke, but I’m working on it. I’ve got it down to weekends only. I also couldn’t go through the week without Diet Dr. Pepper Cherry -cause its my replacement for Cherry Coke. For the rest of my life I couldn’t go without steak, pizza or pasta. Kimberly@PrettyPinkMomma recently posted..Aloha Friday – The Dishes Are Done Man! I couldn’t give up Diet Coke for a DAY, much less a week. Forever, that, chocolate, pizza… and that’s pretty much it. I’ve given up a lot already, thanks to my gastric bypass surgery. Pasta – I LOVE pasta! Denise recently posted..Royal Wedding Friday!!! For one week I could go without whatever but for life, homemade pizza would be hard! Vegetables are difficult for me to give up for a week and rice is impposible to give up for the rest of your life because rice is main dish in our daily meal.